1. From within the item, click the name of the current workflow status at the top of the page. 2. Against the current status, click the 'Mark as complete' button. This will move the item to the next status in the workflow. Anyone assigned to the item will receive an email notification of the status change automatically. 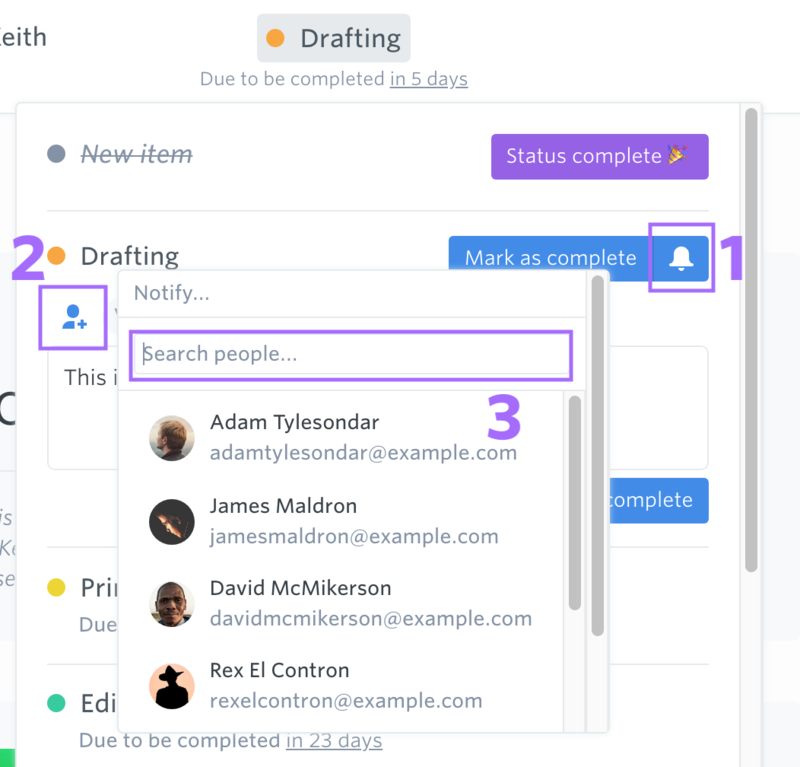 You can also 'loop in' other colleagues to notify them of the workflow status change. Before clicking the 'Mark as complete' button, click the bell icon next to it to open the 'loop in' window. Anyone assigned to this item will already be shown here, with a padlock next to their name. Item assignees will always be notified of status changes. Click the Person and plus icon to choose more people to notify about this status change. Add a comment into the box, and press 'Notify & complete'. 3. 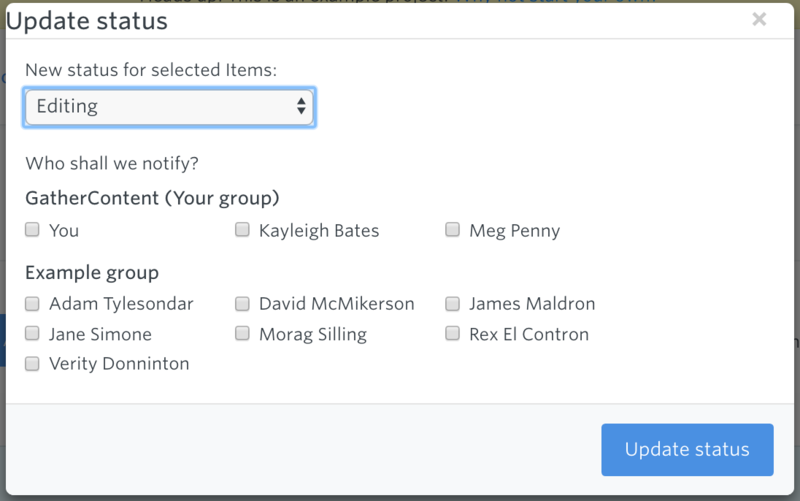 Click the name of the current workflow status of the item to close the workflow dropdown menu. 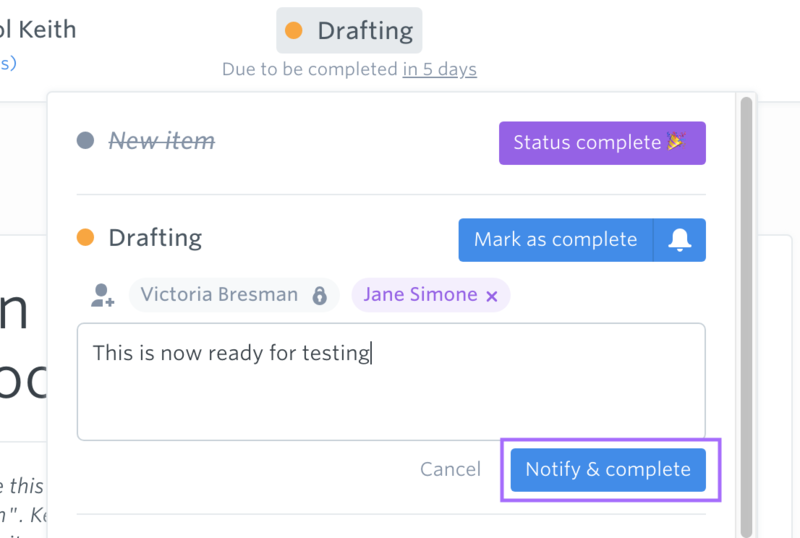 Tip: You can't choose a specific workflow status to move the item into. If you want to move the item to a status further down in the list you'll need to press 'Mark as complete' for as many statuses as you want to progress. 2. Select the items you want to update the status of using the checkboxes. 3. From the Actions button dropdown, select 'Update status'. 4. From the dropdown, select the new status for these items, and click the 'Update Status' button. You can also choose who to notify about this update.